The Salt Lake Community College President’s Art Show featured works from a variety of Utah artists earlier this month at South City Campus. The opening reception was held Nov. 8 in the Center for Arts and Media multipurpose room, where awards were given to the show’s winners. The jury consisted of SLCC President Deneece G. Huftalin, local artist and gallery owner Bonnie Phillips, and a panel of local artists, art administrators and curators. Each of the submissions possess the same unique qualities as their creators. Mitchell Lee is a visual artist who graduated from The University of Utah studying painting. 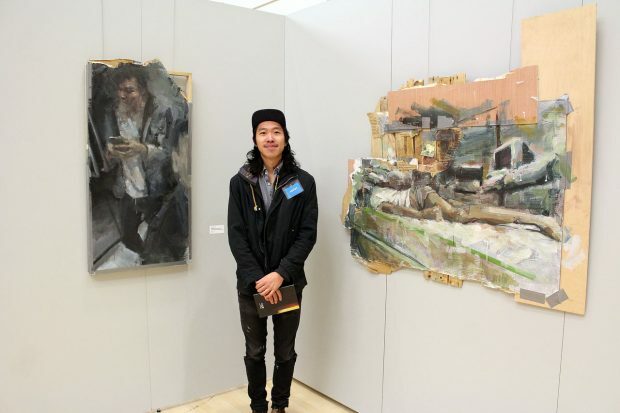 Lee’s art work “Millennial Searching for a Better Word for Depression” was awarded third place in this year’s President’s Art Show. When discussing his entire body of work, Lee defines his art as “portraiture on found objects.” His primary mediums are acrylic and oil paints. Lee started pursuing art in high school and then began painting in college; his favorite class was fingerpainting. Lee also expresses the personal message behind his work, namely the feeling of a sheltered life. Lee has entered art shows at The University of Utah and various calls for entries at galleries around Salt Lake such as Rio Gallery. Chauncey Secrist works in many different mediums such as collage, assemblage, oils, watercolors, photography, and most recently linoleum. He won the Community Award for his display which features 58 bullet casings, one for each victim of the Las Vegas shooting in October 2017. The assemblage Secrist submitted was inspired by the tragedy, and also serves as a commentary of violence in general. “This particular piece has the most impactful message, it’s culturally relevant … There are shootings on a daily basis, almost, and people are conscious of it,” Secrist says. Secrist enters many shows in and around Salt Lake; he describes his art as sometimes being “thematically dark” and he says sometimes people don’t take to that. Secrist expresses gratitude for the President’s Art Show. Tyler Swain studied fine arts at Snow College and later at Utah State University, graduating in drawing and painting. Swain received the President’s Award for his piece “The Road Less Traveled,” from the poem “The Road Not Taken” by Robert Frost. Before beginning the piece, Swain had traveled to Cape Cod and photographed paths near the ocean to use as inspiration. Swain says this piece was a stretch for him, since he hardly paints landscapes and more often paints still lifes. Swain uses only oils as a medium, and on occasion, a small amount of acrylic. Swain says he is always interested in “balancing chaos with order” and he is also drawn to simplicity. “Taking something simple and beautiful and somehow finding that balance between refinement and also spontaneity … Sometimes that may look like something emerging from a border or a background,” explains Swain. View our photo gallery from the 2018 President’s Art Show.